At an EPA hearing last summer, representatives from Koch Industries argued that moderate levels of the toxic chemical dioxin should not be designated as a cancer risk for humans. When members of Congress sought higher security at chemical plants to guard against terrorist attacks, Koch Industries lobbyists prowled Capitol Hill to voice their opposition. And when Congress moved to strengthen regulation of the financial markets after recent collapses, Koch Industries — a major commodities and derivatives trader — deployed a phalanx of lobbyists to resist proposed changes. What’s not so well-known is the activity of Koch Industries in the trenches in Washington, where a Center for Public Integrity examination of lobbying disclosure files and federal regulatory records reveals a lobbying steamroller for the company’s interests, at times in conflict with its public pose. The money that Koch (pronounced “coke”) has spent on lobbying in Washington has soared in recent years, from $857,000 in 2004 to $20 million in 2008. The Kochs then spent another $20.5 million over the next two years to influence federal policy, as the company’s lobbyists and officials sought to mold, gut or kill more than 100 prospective bills or regulations. Oil is the core of the Koch business empire, and the company’s lobbyists and officials have successfully fought to preserve the industry’s tax breaks and credits, and to defeat attempts by Congress to regulate greenhouse gases. But Koch’s diversified interests, and thus its lobbying activities, extend far beyond petroleum. 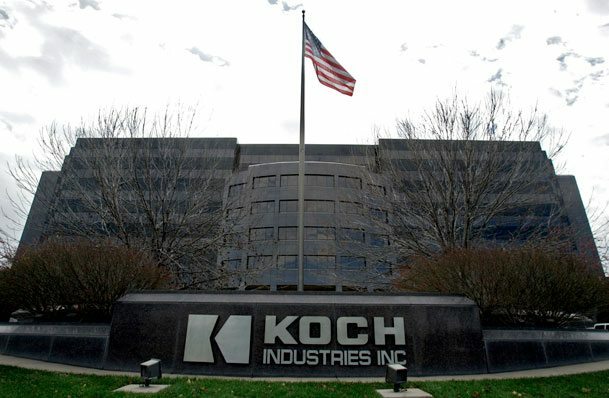 Koch companies trade carbon emission credits in Europe and derivatives in the U.S. They make jet fuel in Alaska from North Slope oil, and gasoline in Minnesota from the oil sands of Canada. They raise cattle in Montana and manufacture spandex in China, ethanol in Iowa, fertilizer in Trinidad, nylon in Holland, napkins in France and toilet paper in Wisconsin. 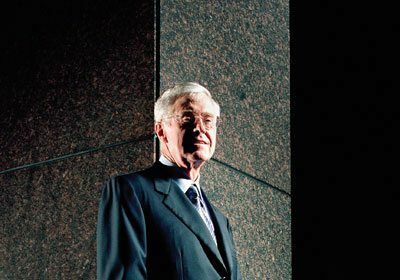 According to the most recent Forbes magazine rankings, Koch had $100 billion in revenues in 2009 — on a par with corporate giants like IBM or Verizon — and stood a close second to Cargill Inc. on the list of the largest private US companies. The firm has 70,000 employees, and a presence in 60 countries and almost every state. Koch’s decision to pour millions into lobbying Washington has put them high on the list of corporations whose lobbyists work the corridors of the nation’s capital. Last year, Koch Industries ranked in the top five — roughly on a par with BP and Royal Dutch Shell — in lobbying expenses among oil and gas companies, according to the Center for Responsive Politics. These totals do not include the work of the trade associations that Koch uses to represent its interests in Washington. There’s a major industry group called the National Petrochemical & Refiners Association, and obscure organizations like the green-sounding National Environmental Development Association’s Clean Air Project, whose membership lists Koch and two of its subsidiaries (Georgia-Pacific and Invista) with a dozen industrial giants like ExxonMobil Corp., General Electric Co. and Alcoa Inc.
Koch’s lobbyists are known on Capitol Hill for maintaining a low profile. There are no former U.S. senators or House committee chairmen on the payroll. The firm had 30 registered lobbyists in 2010, many of whom are Washington insiders with previous experience as congressional staffers or federal agency employees. Gregory Zerzan is a good example. Zerzan was a senior counsel for the House Financial Services Committee before serving as an acting assistant secretary and deputy assistant secretary at the U.S. Treasury Department during the George W. Bush administration. Zerzan then worked as counsel and head of global public policy for the International Swaps and Derivative Association before joining Koch Industries as a lobbyist. Koch clout is augmented by campaign donations to parties and candidates for federal office — $11 million in the last two decades, according to the Center for Responsive Politics — and generous gifts from three family foundations to universities and conservative organizations and interest groups. According to IRS records, the Koch foundations are essential donors (having given $3.4 million from 2007 through 2009) to the Americans for Prosperity Foundation, a nonprofit known for its support of the Tea Party movement. Among the organizations that have each received a million dollars or more over the last five years from Koch foundations are the Cato Institute, the Heritage Foundation, and two conservative think tanks at George Mason University in Virginia: the Institute for Humane Studies and the Mercatus Center. The Kochs primarily donate to conservative candidates and causes but have given more than $1 million in the last decade to the liberal Brookings Institution. And among politicians they supported last year was Andrew Cuomo, a Democrat elected governor of New York with $87,000 from the Koch family. The Center asked Koch Industries and its lobbyists in Washington, in a dozen emails and telephone calls over more than two weeks, to comment on the firm’s lobbying efforts. Koch’s representatives declined the opportunity. But in a March 1 column in The Wall Street Journal, Charles Koch defended his and his company’s practices. The Koch brothers are renowned as free market libertarians. But as a major trader in energy and financial markets, Koch Industries also knows how to hedge. As its corporate officials and publicists decried ethanol as a costly government boondoggle, the Kochs bought four ethanol plants in Iowa in recent months, with a combined annual capacity of 435 million gallons. In Washington (where ethanol tax subsidies cost the Treasury some $6 billion annually) Koch representatives lobbied Congress on ethanol and other biofuel subsidies. “New or emerging markets, such as renewable fuels, are an opportunity for us to create value within the rules the government sets,” Flint Hills Resources President Brad Razook told his employees in the January company newsletter. Koch Industries’ status as an ethanol player goes beyond its new Iowa plants. Koch blends ethanol and gasoline nearby, in its Minnesota refinery. By its own account, the company’s subsidiaries, Flint Hills and Koch Supply & Trading, currently buy and market about one-tenth of all the ethanol produced in the United States. “We are not going to place our company and our employees at a competitive disadvantage by not participating in programs that are available to our competitors,” Razook assured Koch employees. The company has a history of pragmatism in commercial affairs. 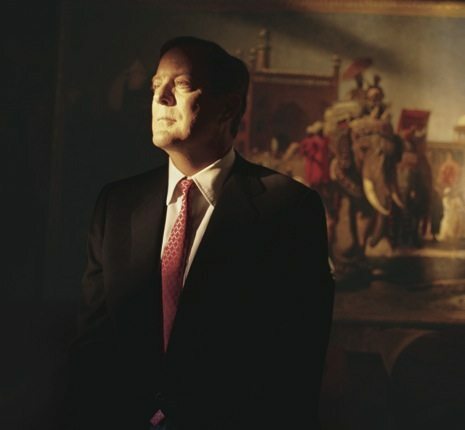 Koch was a pioneer importer of Russian oil to the United States, including a 2002 shipment of Russian crude that Koch sold to the U.S. government to help fill the U.S. Strategic Petroleum Reserve. And though it opposes a cap-and-trade solution to global warming for the United States, Koch makes money trading emissions credits under a similar program in Europe. Nor is ethanol the only form of corporate welfare Koch Industries supports. As it ventures into biofuel production, and uses alternative fuels to power its plants, the company has its lobbyists working “to expand the [tax] credit for renewable electricity production” made from biomass. Georgia-Pacific, the company reported in 2008, was responsible for more than 10 percent of all the renewable biomass electricity generated in the U.S.
Koch’s efforts to limit regulation of toxic substances illustrate the breadth of its lobbying operation. In 2004 Koch Industries purchased Invista, a subsidiary of DuPont, known for manufacturing Lycra, Stainmaster carpets and other textiles and fabrics. In 2005, as part of the same corporate diversification and expansion strategy, Koch Industries bought the giant wood and paper products firm, Georgia-Pacific, adding Brawny paper towels, Angel Soft toilet paper, Dixie cups and dozens of factories and plants to its holdings. Koch has since worked, on Capitol Hill and in various regulatory proceedings, to dilute or halt tighter federal regulation of several toxic byproducts that could affect its bottom line, including dioxin, asbestos and formaldehyde, all of which have been linked to cancer. Through its Flint Hills Resources subsidiary, Koch Industries operates a refinery near Fairbanks, Alaska. So it is not surprising that, when the Obama administration and the Democrats on Capitol Hill proposed to regulate the emission of greenhouse gases in recent years, Koch Industries responded with a fervent counteroffensive. The firm’s lobbying expenditures soared in 2008 as Koch Industries and its subsidiaries — Georgia-Pacific, Invista, Flint Hills Resources, Koch Carbon, Koch Nitrogen — peppered the EPA and members of Congress with objections. Several worked on measures that would strip the EPA of the power to regulate greenhouse gases through the Clean Air Act. Koch-supported groups like the National Environmental Development Association’s Clean Air Project joined the effort. In a recent meeting, five Koch representatives joined colleagues from ExxonMobil, ConocoPhillips, Eli Lilly and other NEDA-CAP members to register concerns with EPA officials over the proposed mandatory reporting rule for greenhouse gas emissions, the record shows. In early March, members of the Republican-led House Energy and Commerce Committee — many of whom had received campaign contributions from Koch employees and PACs last fall — voted to bar the EPA from regulating greenhouse gases under the Clean Air Act. Their action has been endorsed by Speaker John Boehner and Republican House leaders. Of particular concern to Koch lobbyists in Washington, according to their disclosure forms, are measures to encourage or require the use of low-carbon fuels. These sources of energy, in their manufacture and use, contribute less than other fuels to global warming. The Koch refinery in Minnesota is designed to process heavy “high-carbon” Canadian crude oil, and is fed by a pipeline from Canada. Koch “is among Canada’s largest crude oil purchasers, shippers and exporters,” the company says, with a trading and supply office in Calgary and a terminal in Hardisty, Alberta. Much of the oil comes from the mining of oil sands, which have a particularly heavy carbon footprint because the process releases greenhouse gases from peat lands and boreal forest, and requires a great deal of energy to heat and sweat the oil out. When lawmakers in Washington and states like California sought to address global warming by requiring the use of low carbon fuels, Koch Industries responded. Koch lobbyists listed the legislation as a lobbying priority on Capitol Hill. And in California, where a wide-ranging series of measures to slow climate change were launched by former Gov. Arnold Schwarzenegger, Koch joined the fight to defeat them. A Koch subsidiary, Flint Hills Resources, donated a million dollars in support of Proposition 23, an unsuccessful attempt funded by Koch and other energy companies last year to stall implementation of the low-carbon standards and other remedial climate measures in California. Koch lobbyists spend much of their time, according to their disclosure reports, fighting attempts by members of Congress to curb price-gouging, windfall profit-taking and speculation in the oil industry. To this same end, Koch officials worked to dilute a 2009 Federal Trade Commission rule governing manipulation of the energy markets. Meanwhile, Koch has lobbied to preserve some of the oil industry’s coveted tax breaks and credits. One benefit is known as the Section 199 deduction, approved by Congress several years ago to help the hard-pressed U.S. manufacturing sector. In light of the oil and gas industry’s hearty profits, the Obama administration and members of Congress have sought to end the Section 199 subsidy for energy firms and save the U.S. Treasury $14 billion over 10 years. But Koch lobbyists and trade associations have worked to preserve the deduction. Another industry tax break that drew the support of Koch representatives is the venerable “LIFO” (last-in, first-out) accounting rule. It allows energy companies effectively to raise the value of their existing inventory (and thus pay lower taxes on profits from sales) when the price of oil soars. Under LIFO, the oil in a company’s inventory, no matter what it actually cost, is valued at the cost of the last-acquired (usually highest-cost) barrel. The LIFO rule has been a target in recent years for both Democrats and Republicans in Washington, who would like to raise revenue without raising taxes. Koch lobbyists listed the expiring Bush tax cuts as a lobbying objective last year, and the Koch brothers were among an elite, relatively few Americans who profited when the income tax cuts for those earning more than $250,000 a year were extended in a year-end deal. Another of the Bush tax breaks had special meaning for the Koch brothers. Charles Koch, 75, and David Koch, 70, are tied for fifth place, each with a net worth of $21.5 billion, in the latest Forbes rankings of the wealthiest Americans. Included in the deal to extend the Bush tax cuts was a proposal to reduce the federal estate tax. The Kochs have, historically, been players in an ongoing effort by wealthy families to curb or eliminate the tax on inheritances. The final tax deal reached by the White House and Republicans in Congress in December set the estate tax at 35 percent. That makes the new rate considerably more favorable than during the Clinton (55 percent) or even the Bush (45 percent) years, and the lowest it’s been since the 1930s. If one of the patriarchs should die while the new rate is in effect, it would save the Koch family billions of dollars. Another major preoccupation of Koch Industries lobbyists during recent sessions of Congress was the Chemical Facility Anti-Terrorism Standards, a federal effort to identify and regulate chemical facilities that could be vulnerable to terrorist attacks. In 2009, the House passed legislation that would toughen the standards, and require manufacturers like Koch to use safer chemicals and processes to add another level of protection and minimize the effects of toxic releases from terrorist attacks or catastrophic accidents. Koch opposed the changes, claiming they “increase cost and regulatory burden while shifting focus away from security and toward environmental considerations.” The chemical security provisions were listed as lobbying targets by Koch representatives in 2007, 2008, 2009 and 2010. According to EPA records, Koch has four facilities that use chlorine dioxide—in Palatka, Fla.; Zachary, La. ; New Augusta, Miss. ; and Camas, Wash. It has an Invista plant that uses formaldehyde in LaPorte, Texas. Its Flint Hills refinery in Corpus Christi, Texas, uses hydrofluoric acid in refining gasoline. Koch pulls no punches when assigning the blame for the great financial meltdown of 2008: It was the government’s fault, not the markets. “Almost all of these problems (and much of the current chaos) are, at their root, the result of political failure,” said Steve Feilmeier, the chief financial officer for Koch Industries, at the height of the crash. It is not surprising, then, that Koch Industries — a major player in international trading markets — resisted increased regulation and spent heavily on lobbyists who worked to shape the 2010 Dodd-Frank Act and other vehicles for financial reform. The Koch lobbyists focused, in particular, on provisions aimed at regulating systemic risk in the financial markets, and the use of derivatives. Koch Industries started out trading crude oil more than four decades ago, but its trading group has since branched into commodities, derivatives and other risk management products. In that time, the market for trading derivatives and swaps in the energy industry has gone largely unregulated. And in past Congresses, Koch lobbyists labored to preserve the exemption, known as the “Enron Loophole,” that excused energy commodity contracts from regulation. But the Dodd-Frank law gave the Commodity Futures Trading Commission and the Securities and Exchange Commission the authority to craft new rules to subject traders in the energy industry to increased regulation and transparency, capital and margin requirements, and supervision by a derivatives clearing house. Koch lobbyists worked to favorably shape the bill, and have not stopped working since it was passed. Within a few weeks after President Obama signed the legislation, Koch lobbyist Gregory Zerzan had secured a coveted meeting with SEC Commissioner Troy Paredes, a Bush appointee, and his counsel, Gena Lai, to discuss how the government would implement the law. Under that article was comment where someone mentioned they were comforted by the fact that the only Koch product they had in their house they used to wipe their asses. Older Article: Terms of Employment, Terms of Welfare – R U Gonna P in a Cup?